We have searched write-ups and opinions about Mahendra Chaudhry's stash in Australia (the subject of a criminal case) and have found articles written by Victor Lal and Kamal Iyer. We bring you the first of some of the opinions written by Kamal Iyer and will reveal more articles that will show how Chaudhry has changed his tune. The following article titled "Ghost of Valelawa lives on" was published by the Fiji Times on 13th March 2008. BY now the people of Fiji have digested the information on interim Finance Minister Mahendra Chaudhry's tax details and the $1.6million tucked away in his bank account Down Under. After challenging The Fiji Times to name the interim minister on February 21 — reported on the front page of the country's first and oldest newspaper a day later, Chaudhry and the nation woke up to bold front page headline on February 23 proclaiming: "It's Chaudhry". Not to be outdone, the Fiji Sun on Feb 24 proclaimed it was now time for the real story. Having highlighted stories about an interim minister's tax affairs since August 2007, the Fiji Sun through its correspondent, London-based Victor Lal, even published a letter written in Hindi and translated in English, supposedly penned by one Harbhajan Lal of Haryana, India, detailing how much money was channeled into Chaudhry's Australian accounts. Of course a day later, Fiji Sun publisher and managing director Russell Hunter was taken from his Tamavua home in Suva, transported to Nadi and bundled into an Air Pacific flight to Sydney on February 26 and told not to re-enter Fiji. That is another story. But revelations that Chaudhry attempted to evade tax on his overseas accounts have spread like wildfire. In the midst of all this, the real point has been ignored. And that is whether Chaudhry indeed pocketed money raised in the name of the poor, the ordinary and downtrodden citizens and cane farmers of Fiji who happened to be his power base in the last three general elections. Firstly, let me dissect Harbhajan Lal's letter from Haryana. In the letter dated September 9, 2004, Lal is replying to Chaudhry's queries about money raised in Haryana because Lal writes that "you (Chaudhry) have asked details of the funds". Lal then outlines the details of three deposits worth AUD$1.6 million to Chaudhry's Australian bank accounts in 2000, 2001 and 2002. Why did Chaudhry write to Harbhajan Lal after already having received money from Haryana? If indeed the money was collected for Chaudhry's re-settlement in Australia as claimed in Lal's letter, what has Chaudhry been doing in Fiji since his released from captivity by George Speight in July 2000? If Chaudhry had changed his mind and decided to remain a Fiji citizen, wasn't it morally and ethically correct to return the money to Haryana and tell the Indian State of his ancestors that sorry, I don't need the money because Fiji is safe and I have decided to remain in the paradise island! But morality, transparency and accountability disappeared in this case. Secondly, why did Chaudhry tell the House of Representatives on December 2, 2005, that he had not received a cent from Haryana or its former Chief Minister Om Prakash Chautala? 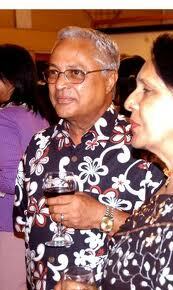 Chaudhry told Parliament what he told the media both in India and Fiji that he had not received any money. He told the Lower House that he asked Chautala to clarify the matter to the media. Chaudhry also told Parliament that because the issue was casting doubts about his honesty and integrity, he wrote to the Indian Minister for External Affairs Yashwant Sinha on February 24, 2003, asking him amongst other things for the Government of India to institute an inquiry to the matter so "this rather sordid affair is put to rest once and for all". Chaudhry stated in the letter he will not condone an "act of dishonesty perpetuated under his name, particularly when its victims are the poor and disadvantage in the society". The questions, therefore, all right-thinking citizens need to ask Chaudhry are these: After having written to Yashwant Sinha asking the Indian Government to inquire into the sordid fundraising affair, why did you write to Harbhajan Lal inquiring about the funds? Why did you ask Yashwant Sinha to institute an inquiry into the matter despite knowing that you had the money safely tucked away in your Australian bank accounts? Were you expecting more than AUD$1.6 million from Haryana? Did you doubt Harbhajan Lal's integrity? And why seek a response from a little known figure like Harbhajan Lal about funds when you requested Yashwant Sinha to institute an inquiry to clear your name? Why did you tell FIRCA that the money was held in trust for your people in Fiji when no such trust account was opened but the funds kept in your name? Why did you fail to declare $220,000 income derived from the Australian bank accounts to FIRCA? And who were you trying to fool? The most glaring contradiction and indeed a sordid comment on the whole fiasco was given to a local radio station Legend FM and to The Fiji Times by the current Fiji Labour Party treasurer and Nasinu Mayor Rajeshwar Kumar. Kumar said all the money collected for farmers by Chaudhry was spent on refugee farmers at Valelawa camp created by the National Farmers Union after the May 2000 coup and on Muainaweni farmers who were taken to the Girmit Centre in Lautoka. Kumar told Legend FM that the Haryana funds were for Chaudhry's re-settlement in Australia. If this is true, isn't Kumar concerned with what his leader is doing in Fiji? Can Kumar publish a breakdown of monies used on people at Girmit Centre and Valelawa? What was the intention to set up the Valelawa camp? At the time of its establishment after May 2000, the NFU and FLP claimed the camp was housing farmers and their families as well as those forcibly removed from their homes. In January 2001, Chaudhry invited Commonwealth Peace Envoy Justice Pius Langa of South Africa to visit Valelawa. Justice Langa told the FLP leader and the camp occupants that the solutions to their problems did not lie in packing their bags and running away. A month later, an SBS television crew was invited to visit Valelawa, in an attempt to portray Chaudhry as saviour of farmers. One of the excerpts of the interview quotes Chaudhry as saying while talking to a farmer, "You have played here since you were little? Don't worry, the world is big enough for everyone." This obviously meant the camp's sponsors had promised farmers overseas resettlement. In mid-2001, 28 families in the camp signed a petition alleging NFU officials were forcing them to enter into an agreement with the union and that those who did not would be denied basic needs. They recalled how in the aftermath of the 2000 coup, NFU and FLP officials toured the Northern Division cane belt urging farmers to move to Valelawa promising them food rations, hospital care, education for the children, security, transport, water supply and even a children's park. Farmers who even had leases of up to eight, 12 and even 15 years quit their farms. But the truth surfaced a bit late for them. On October 24, 2001, The Fiji Times carried a front page story highlighting the plight of the camp occupants after the landowner, one Ram Narayan, threatened to evict them because NFU and FLP failed to pay any rent to him. Farmer Sukh Ram told the newspaper that they had been cheated. He said: "We were told the land had been bought and after three months we'll go overseas." Mr Ram said his daughter died because she could not be transported to the hospital. The plight of the unsuspecting victims of Valelawa is best captured by Fiji Television journalist Anish Chand whose news item on Feb 2, 2003, described the horrific conditions and inhumane treatment of the families in the camp. It is appropriate to re-produce Chand's television story to understand the exploitation of the Valelawa occupants that Rajeshwar Kumar claims were assisted by Chaudhry's overseas collected funds: Anish Chand: "Our visit to Valelawa was without notice no politician or people representing the refugees were told of our surprise visit. And this is what our cameras caught ... children smiling but without any future families huddled together in darkness thinking what the next light will bring." Sukh Ram: "There is no other option we have, there are plenty of trees around here and we also don't have to look for a rope, what is life when you can't enjoy it. Now we are thinking if we didn't come here, it would have been better. Life is so miserable. I mean there is nothing to eat, us adults can remain hungry but what about the children?" Shanti Devi: "If our children don't have education, then how are they going to support us, the school is about to open and we haven't got any money to send the kids to school". Whilst it is understandable that Rajeshwar Kumar will go to any lengths to defend and save Chaudhry, the reality of Valelawa that I have just described demolishes his claim that the "refugees" were financially assisted. The other issue here is Kumar's statement on Legend FM that after becoming treasurer of the Fiji Labour Party last year, he has looked through un-audited accounts of the party, however, he has found nothing sinister. Which un-audited accounts is Kumar talking about? According to his leader, Labour accounts are audited every year. Can therefore the former Labour treasurer, Agni Deo Singh, enlighten the people of Fiji about the un-audited accounts that he failed to get audited during his term as FLP treasurer? Lastly, the FLP management board members over the years have a lot to answer. Weren't they aware of the overseas bank accounts of their leader? If not, why didn't they question Chaudhry after repeated rumours on the overseas funds all these years until it was recently exposed? Therefore, they are equally to be blamed. All religious scriptures state that a person's past will one day return to haunt him or her. The Haryana financial windfall for Mahendra Chaudhry and the ghost of Valelawa live on. Something must be wrong with Fiji Indians if they can not see what this man is all about.How can this crook be PM of Fiji when he keeps on running to India, Fiji Indians can do better. A decent person does not use Tax-payer money to renovate his house.A decent person aged about 60 does not keep girlfriend when he has a wife at home.Ask Mrs Chaudhary what happened to all her teeth? He is a low life and Fiji is not his home, he should go back to India. Throw this thief in jail and recover the money from his account to feed the poor people in Fiji. Chaudhry has always been a painful person to work with. Has a stubborn mind of his own and filling his own pockets. Kaiyum and Bai, your time will come so enjoy the time that is remaining as your day will hit you hard that you will think of Aloo Ghobi and Jungli Murghi Masala all the way to the prison. Shame on this crook--the so called leader--the champion of the poor.He robbed the poor of their funds from India-why should he personally benefit.Others were held captives also.How about giving some $ to Muttuswamy's widow---or to Krishna Datt--even Baba.--and Rishi Shankar for flying off to NZ in a SARI in 1987!! MPC has a lot to answer for in regards to the existing plight of cane farmers and the whole poor Indian population in Fiji. MPC had manipulated their ignorance and unwavering belief in him to exploit and continiue to take and take for him and his family. Frankly he should be taken down and should never be allowed back into the political or any other national arena. LIAR..LIAR..LIAR Chaudry's favourite words... Look whose lying now. With the many allegations he levelled against government fanning the fire of racial hatred and mistrust. A two faced man. They shouild have killed him in parliment. Once a thief, always a thief and forever a thief. Small time crooks like Chaudhry unfortunately do not fit into the high profile of Bani and Aeeasss. Chaudhry steals from the poor and Haryana, Baini and Asssss steal from the poor and the rich and the whole nation. God help all of us. today I am laughing today , I have been telling Indians, Chaudhry is crook ,thug but they do not listen. Rishi Shankar ????? ?------who is he ???? How about Dr Satendra Nandan ??? ?----he also ran away---back now and writing books again !! !---he calls them books ! !----what a waste of trees--he should be charged for destroying trees !!!! Is that a rolex on his wrist? WHERE IS THE HUGE SUM HE COLLECTED IN SYDNEY FOR THE MAUAVENI FARMERS? WHO WILL LEAD LABOR PARTY? LEKHRAM VESHNOI OR DR SAHUKHAN! oh he has patched up with the gujjus now that he has a pretty hot looking guji daughter in law and guji in laws. Anon 10.09am 16 Sept. Maybe his grand father picked it up duty free in 1911 on his way to fiji in Singapore. Pls leave him alone. Unnerving part for Viti's political future is that many Indians still view him as a role model? And its not as if he could step down gracefully - pass it onto his son & heir given this ones current predicament in Nadi.